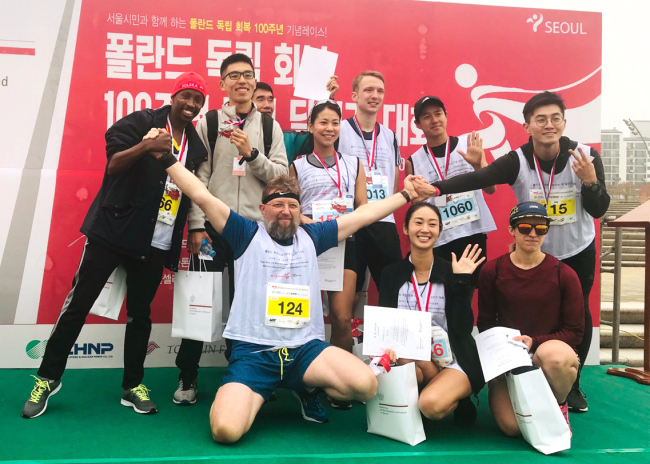 To mark the 100th anniversary of the country regaining its independence, the Polish Embassy organized a friendly marathon at Ttukseom Hangang Park in Seoul on Sunday morning. Over 400 people participated in the annual Polish Independence Run, which comprised 10- and 5-kilometer runs and a 1-kilometer walk for families. The Seoul race was one of 100 races held in Poland and abroad on the same day. Nov. 11 marks the Central European nation’s centenary, commemorating its resurgence as a sovereign power following 123 years of occupations by Russia, Prussia and Austria-Hungary. “On November 11th, 1918, Poland regained its independence and the streets of our cities were swept by euphoria. On that day, Germany signed a ceasefire ending the First World War, and the Regency Council bestowed full civil and military power to Jozef Pilsudski (a Polish statesman who served as the Chief of State 1918-22 and First Marshal of Poland from 1920),” Polish Ambassador to Korea Piotr Ostaszewski told The Korea Herald in a written statement. The Seoul Metropolitan Government joined the celebration, lighting up Seoul City Hall on Sunday from 7-9 p.m. in red and white, the colors of the Polish national emblem. Other landmark buildings around the world were similarly lit up, including Egypt’s Pyramid, Italy’s Leaning Tower of Pisa, the Hungarian Parliament Building and the Zappeion building in the National Gardens of Athens.